Provide comfort for the family of Brett Berziel with a meaningful gesture of sympathy. 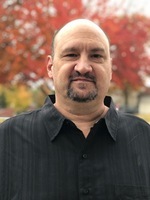 Brett M Berziel, 50, of Joplin, MO passed away on April 1, 2019. He was born on October 23, 1968 in Joplin, MO. He resided in Springfield, MO for 11 years before moving back to Joplin. He graduated high school in 1987. He was very good at sports and played football all 4 years, he played on Parkwood’s 1985 team as a sophomore on the varsity team. After graduation Brett attended MSSU and then joined the US Army. He was stationed in Germany during the Gulf War. After coming home from the army Brett struggled with mental illness. He was very intelligent and was an expert on his illness. He battled it for years and appreciated his support system he had from his family. He was a brother, son, uncle and friend. He is survived by his mother, Sandra McConnell; His father Gale Berziel; his sister Becky Jacobs(Mike); brother, Braden Berziel (Sofia); 6 nieces Grace, Ally, Lilly Jacobs, Isabella, Daphne and Bianca Berziel. He was preceded in death by his step father, Paul McConnell; Grandparents, Edith & Ralph Parise, Fred & Fern Berziel; and an Uncle Jim Parise. We have comfort in knowing he is now surrounded by them with a whole and healthy mind. A celebration of life service will be held at Ozark Memorial Park Cemetery at 2:00pm on April 12, 2019. Family and friends may meet at First United Methodist Church for a light meal at 12:30 and will follow to cemetery. Please RSVP to for Lunch attendance to Becky Jacobs 417-483-2157. In lieu of flowers the family would appreciate donations to NAMI or Joplin Crosslines. To send flowers in memory of Brett Berziel, please visit our Heartfelt Sympathies Store. We encourage you to share your most beloved memories of Brett here, so that the family and other loved ones can always see it. You can upload cherished photographs, or share your favorite stories, and can even comment on those shared by others.